Hard to imagine that it's been two months since I've posted here, my favorite journal. Summer was filled with visits to college campuses, two trips to Northern California to take and pick-up Andrea from her 11-day, 73-mile backpack through Yosemite, and a delightful, weeklong sojourn in Portland, Oregon with my 31-year-old daughter and her husband. 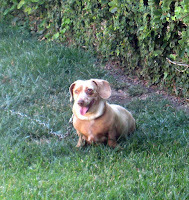 Chestnut, our beloved 11-year-old dachsund, died about a month ago, peacefully of a natural causes (a heart attack?) in our backyard. We adored her from the time she entered our life as a 12-week-old puppy. She had a sweet temperament, and brought much love and fun into our home. We were genuinely surprised at the depth of sadness we felt at her passing. Politics, and writing about politics, have consumed my energies, too, of course. Politics and the pursuit of social justice can be a good and noble calling. But political shenanigans, and political devotees, can also be frivolous, infuriating, and even destructive and nefarious. Langorously read from a relaxing book, "A Year in Provence," by Peter Mayle. Enjoyed a glass or two of velvety California pinot noir. Watched baseball with Ron, especially our surging Los Angeles Angels. Attended our annual church picnic. Listened to 1960s-era jazz I've grown to savor on my iPod, by Dave Brubeck. Made a delicious dinner for Ron and Andrea: seared pork loin chops and paprika cauliflower, followed by lime sherbet. AND... took a Sunday afternoon nap. I now feel refreshed and ready to face the last 57 days of this political season. And I'm already planning my post-election relaxation: on November 6th, I fly to Denver to spend five days celebrating my parents' 60th wedding anniversary, and to enjoy the Rocky Mountain fall air. Ron and Andrea can't get away to join me. And I'm thinking that my laptop may stay home, too.